Saturday, June 30 was our day of transition from San Juan del Sur to Managua, due to a scheduling conflict that had arranged Courtney’s flight home to be the day before Sara’s & mine. The packing situation in my backpack had deteriorated rather considerably since our arrival, thereby necessitating that I take everything out and start over. Good times. The souvenirs and gifts I’d purchased took up a large percentage of space. I suspect that had something to do with the two pounds of coffee I’d bought from Cafe del Flores. Once we were all re-packed, we decided to take one more stroll through San Juan, picking up some last minute souvenirs and making a pit-stop at a bakery that we’d driven by on our way home from the beach every day. We may have been too successful in terms of souvenir shopping (yes, that’s possible). 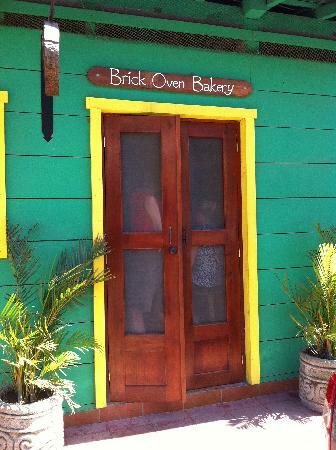 The bakery, or panaderia, was called Pan de Vida (“Bread of Life,” I like it). It had a brightly painted storefront with subtle wooden sign and a single door. Walking in, I had a moment of confusion because it appeared we had walked right into the kitchen, instead of the bakery itself. There was one woman, wearing a Survivor: Nicaragua headscarf, kneading bread on a long counter, who looked up as we entered. She washed her hands and came over to greet us. The kitchen itself was yellow, clean, and felt friendly, with a brick oven in the back. The woman showed us a small selection of fresh bread: aceituna (olive), sourdough, multigrain, regular, banana, and carrot. Courtney bought a loaf of the regular and I bought some sourdough, figuring that would be enough to get us through the next day or so. We returned Hotel Estrella after this, thanked the manager for everything and walked down the street to Casa Oro to await the shuttle to Managua. While we waited in the reception, we watched part of a video on scuba diving in Nicaragua. It seemed to focus predominantly on some bizarre creature with no clearly discernable eyes, legs, or mouth and with no real way of moving about, short of being buffeted by the current. It looked rather like a sea cucumber or an overlarge slug with a duster around its bottom side. For the record, I just Googled “sea cucumber Nicaragua” and, whatever this creature was, it was not a sea cucumber. It was, however, gross. We shared the shuttle to Managua with three girls from Canada who were on their way to Leon. I really wish we’d been able to see Leon because I’ve heard many great things about it, including the fact that it’s less touristy than the other places we’ve been. Two hours later, we arrived in Managua. It was not entirely what I was expecting, not that I could articulate what that was exactly. There were many American chains. I’m always disheartened when I see Burger King and McDonald’s in foreign countries. They are so gross. Managua was cleaner than I expected, plus it had the first traffic lights I’d seen in Nicaragua. We hit traffic almost instantly upon our arrival, which worked in our favor a little bit because the driver wasn’t entirely sure where our hostel was. The road the driver wanted to take to the hostel ended up being cordoned off due to what appeared to be a block party. Fortunately, another taxi driver offered to lead us in the direction of the hostel and all was well. We were staying in the Managua Backpackers’ Inn, a clean and well-kept hostel located in a safe neighborhood, just off the main road and a five minute’s walk from a shopping mall (y’know, in case you’re into that sort of thing). We checked in and found that we were only paying $12/person for two nights. Amazing. We left our stuff in the 6-person female dorm we would be sharing with two other girls who happened to be deaf and wandered around the hostel a little. I was thrilled to see that there were hammocks in the backyard, next to the pool. I swear, one day I will live in a place where I can install a hammock. That may be all I want out of life.